For the last several years, I celebrated the morning of the Fourth of July by helping with a carnival hosted by my singles ward (church congregation). The carnival is accompanied by a breakfast and parade, but I’ve never been able to participate in the parade because I volunteered at the carnival. I’d planned to volunteer this year as well, but I was precluded from doing so because of my cold (I didn’t want to pass it along to anyone else). The carnival has become a tradition for my family, though, so I still attended—just on the observing side rather than the hosting side. At first it was strange to not help, but it was wonderful to participate with my family. I was able to watch the parade for the first time. 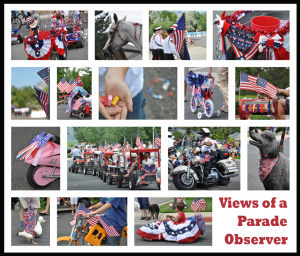 It’s a small community parade, and it was a treat to see the kids with decorated bikes donned with streamers. We even saw ducks and goats strutting the red, white, and blue. At the carnival, I was able to walk around with my nephews as they played games instead of seeing their excitement only when they played games at the booths I hosted. And it was enjoyable to watch the community bonding instead of focusing on details to make sure everything was functioning well. The role reversal left me thinking about how important it is to break outside our normal roles sometimes to enjoy a different perspective. I think that’s why Disneyland is such a popular place—we get to set aside the responsibilities of adulthood and simply play. That’s why reading is so pleasurable—it can take us to a different setting that allows us to momentarily put aside our concerns. It can be refreshing. Perhaps sometime this month we can all experience a little role reversal of sorts. If we’re normally the center of attention, we can see what it’s like to sit back and listen to others one night. If we’re normally the quiet one, we can try participating a little more. If we’re normally completely structured in our plans, we can set aside one night to be spontaneous, or vice versa. We may just enjoy being the carnival observer rather than the host. * Had brunch at IHOP after the carnival. Mmm. * Saw Ice Age: Dawn of the Dinosaurs. I enjoyed the first two movies of the series, and this third movie did not disappoint. * Enjoyed another parade—this time it was a larger city parade. * Attended an outdoor concert. Sadly, the power went out after the first few numbers. It was restored about fifteen minutes before the fireworks. The downtime in between provided a great chance to talk, though. * Watched the fireworks. After thinking about being an observer rather than assuming my usual role (in this case, a trigger-happy photographer), I took far fewer photos than normal. I typically watch the fireworks through the viewfinder of my camera. Last night I opted to enjoy them in the sky instead. I still took some photos, but the majority of the display was spent with my camera in my lap. It did feel refreshing. * What did the playground look like? * Where was the first place the students ran once you went outdoors? * Were there days you couldn’t go outside because of weather or air quality? * What were your favorite games to play? * Who did you spend your recess time with? * How did your choice of recess destinations change as you switched grades in elementary school? Now that memories are flowing, it’s time to get started. Ready, you’ve got 10 minutes. Go! To see what I came up with, read here. This entry was posted on Monday, July 6th, 2009 at 11:20 PM	and is filed under Fun and Games, Perspective. You can follow any responses to this entry through the RSS 2.0 feed. You can leave a response, or trackback from your own site.